Find hotel near Dunes Safari And Camp Raj ..
At Dunes Safari, various packages for camps and safaris are offered. 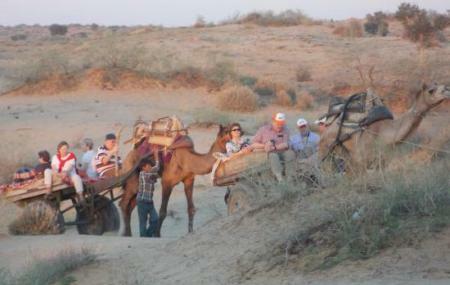 The company arranges a 3 day camel safari around Bikaner, Raisar, Panpalsar & Gandhwala villages. The safaris offer a unique experience of the Thar Desert. Professionals with more than 20 years of adventure tour experience manage the tours. The camp offers facilities such as tent accommodations, jeep safaris and gala dinners on dunes with bonfires, traditional folk dances and musical programs. How popular is Dunes Safari And Camp Rajputana, Bikaner? People normally also visit Nagnechiya Maa Temple while planning their trip to Dunes Safari And Camp Rajputana, Bikaner.